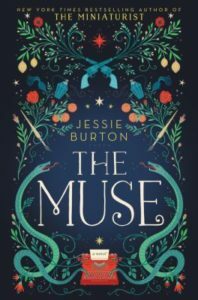 Alternating between 1930s Spain and 1960s London, The Muse is a compelling story with its threads tied together by a painting and its artist. In the months leading up to the Spanish Civil War, teenager Olive Schloss struggles with identity, relationships, and artistry. In 1967 England, Trinidadian writer Odelle faces similar challenges. Early on in Jessie Burton‘s sophomore novel (after The Miniaturist), it’s obvious that a mystery in the plots of the parallel narratives will be resolved; the surprise (and joy) is in how Burton accomplishes it. This novel is for fans of historical fiction and art-related novels such as The Girl You Left Behind by Jojo Moyes, The Art Forger by B. A. Shapiro, and That Summer by Lauren Willig. Plus, check out our book list featuring Art & Artists.